Navigate: StoreFront / Cake Shop / Ingredients / LorAnn Coconut Bakery Emulsion - 4 oz. 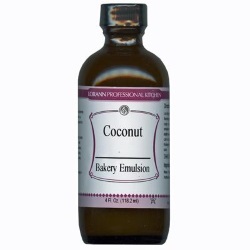 LorAnn Coconut Bakery Emulsion - 4 oz. Coconut baking & flavoring emulsion is a taste of the tropics. Use LorAnn Coconut Emulsion in any recipe calling for coconut extract and get more flavorful results! Perfect for adding a true coconut flavor to cakes, cookies, frostings & sweet breads.